The 1994 Royal Rumble ranks very high on my list of rumble favorites. The finish of the main event as a 12 year old kid was epic. I remember going to school the next day and talking about it all day. Some friends were claiming Lex’s feet touched first, while others were petitioning that Bret’s feet touched first. As a Bret Hart fan, I was just happy that he was a co-winner especially considering that it looked like Bret wasn’t even going to be able to compete in the Royal Rumble match. Earlier that night, Bret and Owen Hart had a tag team match against The Quebecers. During this match Bret fell out of the ring when Johnny Polo – The Quebecers manager – pulled the rope, causing Bret to hurt his left knee. Bret was able to continue, but The Quebecers focused their attack entirely on Bret’s knee. The referee called for the match to be stopped when Bret collapsed attempting the Sharpshooter. This match was for the Tag Team Championship and Owen was irate that Bret had caused him a chance to become champion for the first time. Bret was left lying in the ring unable to walk because of both the earlier damage done by The Quebecers and Owen kicking Bret in his already injured leg after the match. Bret’s status for the Royal Rumble event was now in question as to whether he would be able to compete. After Bret’s first match and before the Royal Rumble match itself, there were 2 other great matches. Another one of my favorites, Razor Ramon, defended his Intercontinental Title against I.R.S. This match ended in great controversy when Shawn Michaels showed up with his Intercontinental Title after being stripped of the belt. This would setup their epic Wrestlemania X ladder match. Another instant classic on this event was The Casket Match pitting the unstoppable Yokozuna against the Deadman – The Undertaker. I think every fan was expecting The Undertaker to end Yokozuna’s long title run, but with the help of a lot of outside interference, Yokozuna won the match. After the match was over, in a chilling turn of events The Undertaker was raised to the rafters after a short video of him inside the casket where he vowed to return. This of course was the setup for the awesome Undertaker vs Undertaker match later in the year at SummerSlam. On to the Royal Rumble match itself. Owen Hart was an early entrant who came out to a loud chorus of boos; Owen’s heel turn was complete. This would start a big feud with his brother Bret. Diesel was also an early entrant in the Royal Rumble match. At the time he was heel, previously interfering in The Casket Match. During the match, Diesel eliminated many superstars including Owen Hart. As he eliminated entrant after entrant – especially Owen Hart – the crowd began to get behind him a bit. I would consider this the start of Diesel’s push to becoming one of the bigger superstars in the WWF at this time. Not only was Bret Hart’s position in the Royal Rumble in question, Lex Luger’s was as well. He was shown getting pummeled back stage by Mr. Fuji’s cronies. Mr. Fuji didn’t want Lex to be able to enter the Royal Rumble as it was his only way to get a rematch for the WWF Heavyweight Championship after winning by count out at the 1993 SummerSlam. 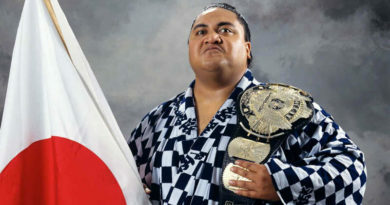 To Mr. Fuji’s displeasure Lex entered successfully as the 23rd entrant, immediately following The Great Kabuki’s entrance; one of Mr. Fuji’s cronies. 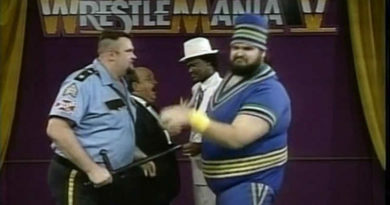 The 25th entrant was supposed to be Bastion Booger but he was conspicuous by his absence. Vince McMahon on commentary made the incorrect assumption that this must have been Bret Hart’s spot and that he was too injured to continue. I was crushed, I wanted to see Bret win and get another chance to defeat the unstoppable Yokozuna. As the countdown clock came on for the 27th spot, the crowd went nuts, it was Bret Hart! He came hobbling down to the ring with praise from Vince about his guts to try and compete even with his injured knee. Immediately it was not looking good for Bret. The ring was full of over 10 competitors while Bret lay on the mat taking shot after shot to his knee. Slowly but surely after all 30 competitors had entered the ring, one-by-one the wrestlers were eliminated leaving it down to just 2: Lex Luger and Bret Hart. They exchanged several punches and Luger picked up Bret to eliminate him. Bret was able to escape, but by this time they were leaning on the ropes and Bret’s momentum carried both Lex and Bret over the top ropes. At this time, there was mass confusion. The announcers did not know who threw who over the ropes. The referees were arguing and The Fink came on and announced Lex Luger the winner. I was upset, I thought Bret had won. Bret began walking back to the dressing room when Lex’s music was stopped and The Fink announced that the winner was actually Bret Hart and his music began playing. Bret returned to the ring to have his arm raised. Then the referees were arguing each raising Lex and Bret’s arm respectively. This led to Jack Tunney, the WWF President coming to the ring and declaring that both men touched the floor at the same time and announced that both Lex Luger and Bret Hart were co-winners of the 1994 Royal Rumble. Who would receive the WWF title shot at Wrestlemania X would not be decided until next week’s episode of Monday Night Raw. The crowd received this news to a mixed reaction of cheers and boos. 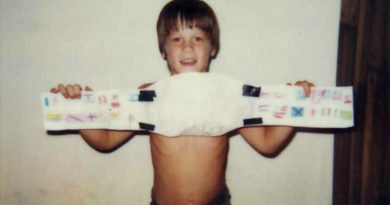 I felt much the same, but at least my man Bret Hart was one of the winners! Bret of course would go on to win the WWF Championship at Wrestlemania X in the second of two main events.